July's Challenge - Consistency is the key. We are constantly bombarded by quick fixes and instant results, so much so that we’ve been convinced that those impossible claims ACTUALLY lead to lasting results! Marketers have our number, it’s really nice to see quick results especially in a world where most things worth having come VERY slowly. A good education, career development, mastery of a skill, building a nest egg, raising children, these are things that take a lot of time and consistent effort. These are all extremely rewarding achievements but we’re talking about 10,000 hours! Take a second to think of something in your life that you want to achieve but have not yet been successful in doing so. Are you taking any steps (big or small) towards making that thing happen? If yes, are you taking those steps consistently (daily or at least several days per week)? If yes, have you slowly and incrementally improved on that step to be further along than you were last week/last month? If you are anything like me, my answer is yes, no, no. No surprise why I haven’t achieved success! This month we’re going to challenge you (and ourselves) to make a commitment to consistency in some aspect of your health/wellness journey. Now this commitment can be small, it can be simple, that’s fine! It’s all about getting you to commit to doing something consistently that heads you in the direction of that goal for the next 3 weeks. For me, I’ve been dabbling with mediation on and off for the last 4 years and I really want to achieve a consistent practice. I just finished the book Eat, Pray, Love written by Elizabeth Gilbert and her own struggles / frustrations with mediation hit home. It’s clear that unless I commit to do this practice consistently just like she did, that I will be in the same place that I am now. So for the next three weeks, I commit to waking up 15 minutes before I need to and doing 10 minutes of meditation EVERY morning. Ten minutes is not a lot and I know that 20 minutes is not realistic so for now, I will stick with something that I know I can do successfully no matter how short. I hope you’ll join us in committing to do something that will help you take a step in the direction of that goal that you haven’t made any progress toward achieving. For this challenge we will have public reporting to help ourselves stay accountable towards our small commitments to consistency. To join the challenge: Simply click the link below and add your name to the spreadsheet with your commitment and the number of times per week that you plan on doing your activity. Moving forward each participant will be responsible for recording the number of times per week they successfully did their activity in the spreadsheet so we can track each others commitment to consistency. Click here to access the spreadsheet and make your commitment! 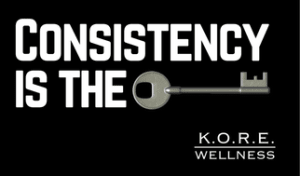 As always, if you need help figuring out what your commitment should be, don’t hesitate to email either your trainer or myself elise@korewellness.com for help!